ANC6B Chair Chander Jayaraman (at left), tells Ambar owner Ivan Iricanin (standing) that he can’t support the Historic Preservation Application without a commitment for indoor trash storage. Also pictured, left to right, Commissioners Burger, Loots, Grace, and Hagedorn. The first item on ANC6B’s agenda Tuesday night following the outpouring of community outrage at the city’s inability to deal with rats (see here: http://bit.ly/2mQRCFS), was the Historic Preservation Application for the planned roof deck on Barracks Row’s Balkan Restaurant Ambar. The ANC has been pressuring Ambar to store trash indoors as part of the on-going battle against the rats of Barracks Row. Technically, Historic Preservation is far removed from the issue of rodent control, and the ANC was trying hard to find a way to signal the applicant and the city the degree of their commitment to use every tool available to impose best operating practices on restaurants in ANC6B. Ambar plans to add an additional 50 seats in a new roof top dining area with a retractable glass roof, doubling their daily production of trash. ANC6B Chair Chander Jayaraman and Commissioner Diane Hoskins maneuvered to find a way to tie the trash storage issue to the Historic Preservation Application. Other commissioners balked, saying that although they might support the trash storage requirement, that matter would be more properly addressed when Ambar came back to ask the ANC’s endorsement for a “Substantial Change” in their liquor license. For his part, Ambar owner Ivan Iricanin told the committee that while his plan provided for indoor storage of grease, indoor trash storage was impossible – there just wasn’t enough space. The commission deadlocked on three attempts at incorporating language related to trash storage in their recommendation to the Historic Preservation Review Board (HPRB) before finally voting 6 – 4 (with Commissioner Nick Burger changing his vote to aye to dispose of the issue) to take “no position” on Ambar’s Application. With the matter referred up to HPRB with no mention of trash, Ambar owner Ivan Iricanin left the room. 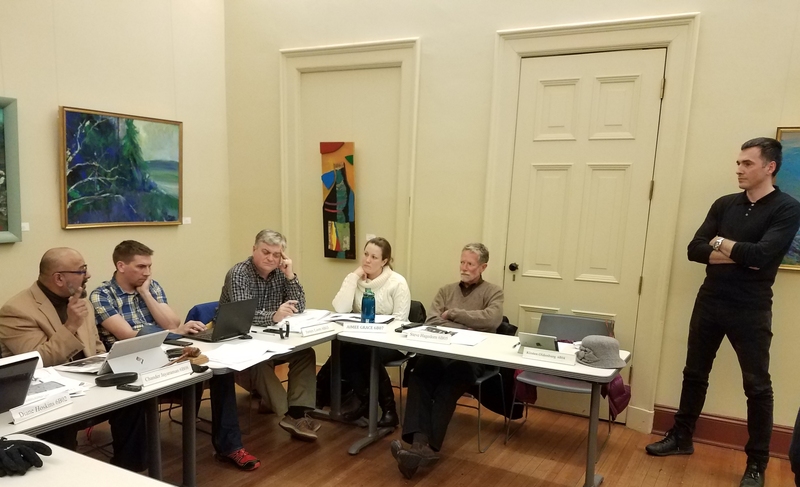 Hot on his heels, however, were the Barracks Row neighbors who were determined to use the momentum of the community’s heated antipathy to rats to wring a commitment on indoor trash storage from Ambar. In the ad hoc hallway meeting which followed – Ambar neighbors Linda Elliott, Linda Young, and Catherine Szafran – with support from the Mayor’s Ward Six representative, Kelly Jeong – convinced Iricanin to commit to indoor trash storage in exchange for community support before the Bureau of Zoning Adjustment for a variance to allow Ambar to extend their building three feet to the property line, allowing additional square feet for all three stories of his building. They told Iricanin this was feasible because of precedents set by Matchbox and CAVA. In exchange, and if successful, Iricanin agreed to carve out enough extra space on the first floor for indoor storage of trash, recycling, and grease. ANC6B had previously pitched this to Iricanin who resisted it as too difficult and time consuming, but neighbors were able to overcome those reservations. Several Commissioners, when told of the outcome of the hallway negotiation, seemed pleased at the outcome. The need for a better strategy is obvious. CM Allen has pledged to take a crack at it, and it should be city wide. If Allen needs a place to start, how about addressing the enforcement problem? Here’s an idea. The Office of Rodent Control is understaffed. Give it more funding. Why this easy remedy hasn’t already been taken is hard to understand. And, according to Elliott, the Office of Rodent Control has lost the ability to issue fines for trash storage infractions or the existence of burrows. They should have the same ability as the Department of Public Works or the Department of Health. Give it to them. ANC6B’s Community Outreach and Constituent Services Task Force, co-chaired by Commissioner Jennifer Samolyk and Diane Hoskins, will hold a community meeting on the rodent issue on Tuesday, March 21, at Hill Center. Gerard Brown of DC Rodent Control will be a featured speaker. Excellent double teaming by ANC and residents!! One question tho: how/when did Rodent Control lose the ability to enforce fines? Re the fines, I spoke based on a partial misunderstanding. Vector (which is part of DOH) can still issue fines for failure to maintain trash properly – an ability similar to the fining power of DPW. However, when the Rodent Control Act was repealed (circa 2005), Vector lost the ability to issue its standard $500 fine for failure to eliminate rat burrows and other places where rats shelter. This had been a critical tool tool in Vector’s arsenal, especially since Vector has only 4 inspectors and one supervisor for the entire city. There may still be some method by which Vector can seek civil penalties of some sort against business and property owners who do not abate burrows and shelter, but if that ability exists, it is neither well understood nor used. If you are interested in additional details, please attend the ANC6B meeting on March 21 (Tuesday) 7 pm Hill Center, where the Head of Vector, Gerard Brown, will be discussing rodent control issues in ANC 6B. Thanks and sorry for my mistake. One additional note: the neighbors are very grateful to Ambar’s owner, Ivan Iricanin, and Ivan’s architect, Gayll Worsley, for their willingness to take on the extra work of seeking a variance and their willingness to commit to creating a fully functional indoor space for trash, recycling and grease if we can obtain the variance. Ivan’s willingness to change his mind demonstrates a real commitment our neighborhood. We also very much appreciate all that the ANC did to make this resolution possible. Note that his willingness to make changes or be responsive to the neighborhood only comes after incredible efforts from neighbors and ANC commissioners to get his attention and the willingness to use all leverage possible. It has been this way since their first license application and is a testament to the value and importance of firm handed and constructive engagement of the neighborhood. congratulations. and thanks Mr. Iricanin. I wonder if a similar approach might work with tunnicliffs and box car?